Seafaring 101 is a course of study designed to introduce participants to many aspects of seafaring. The course touches on a broad variety of subjects intended to develop an interest in further exploration. The course material presented is both informative and entertaining. Classes will be held aboard the 65' Topsail Schooner "Blarney Pligrim" docked at the Coast Harbourside Marina, 146 Kingston Street, in downtown Victoria. The course consists of eight two-hour classes. Several classes are held once per week for eight weeks. Each class is limited to eight participants. An introduction to the course material. The workings of the ship. 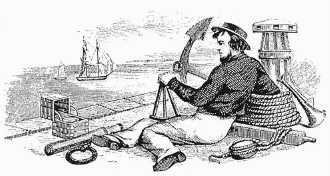 The art of "Marlinspike Seamanship"
Week Two - Salt On Your Tongue. The surprising prevalence of the language of sailors in everyday speech. The Rules of the Road. International Regulations for Preventing Collisions at Sea. Week Three - Row, Row, Row Your Boat. learn the basics of oarsmanship. Week Four - Where Are We? Learning the principles of Coastal Navigation. Week Eight - What Have We Learned?